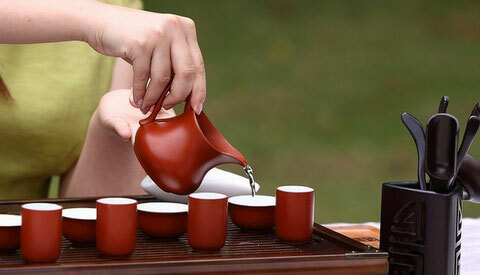 Oolong tea is a traditional Chinese tea which is primarily grown and processed in China and Taiwan. This tea, being semi-fermented, has a unique taste that is quite distinct from the traditional black or green teas. Also known as wu long, this tea derives its name from the Chinese harvester of the same name who created it. Being native to China, it is frequently served in Chinese restaurants with meals and is commonly known as ‘Chinese restaurant tea. Elements Caffiene, flavonol, polyphenol, vitamin C&E, catechins, carotene and minerals such as zinc, selenium and florin. Oolong tea belongs to the same family (Camellia sinensis) as green and black tea. The difference between them lies in the processing. Green tea is obtained by lightly heating the freshly picked leaves to halt the process of oxidation. When the leaves are allowed to oxidize for a short period of time, it results in the formation of oolong tea. When left to oxidize for a longer period of time, the tea leaves turn dark and the end product is the more traditional black tea. 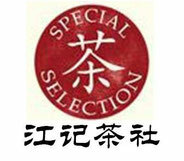 Therefore green tea is un-oxidized, oolong tea is semi-oxidized and black tea is fully oxidized. Fresh tea leaves have a high amount of catechins. Oxidation reduces the levels of catechin in the leaves. 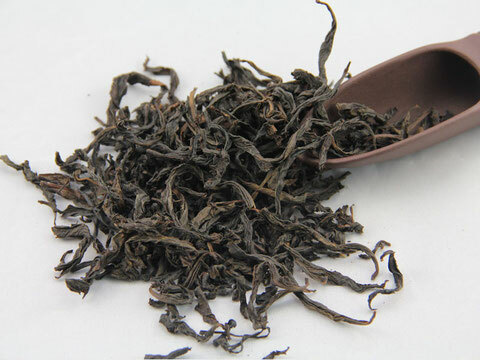 Therefore, oolong tea leaves have moderate levels of catechin. They have an oxidation rate of about 10%-70%. This tea is the richest among all the other varieties in that it not only has a strong and refreshing taste, but is also clear and fragrant. 1. Cardiovascular Benefits: Regular consumption of oolong tea is known to reduce the cholesterol levels, thereby lowering the risk of heart attacks. Research proves that those who drink 1 to 6 cups of oolong tea in a week were at a lower risk of succumbing to cardiovascular diseases. 2. Combats free radicals: Skin lipids are essential for a vibrant looking skin. Free radicals accelerate the process of aging by converting the skin lipids into lipid peroxide. This results in dark spots and pigmentation of the skin. 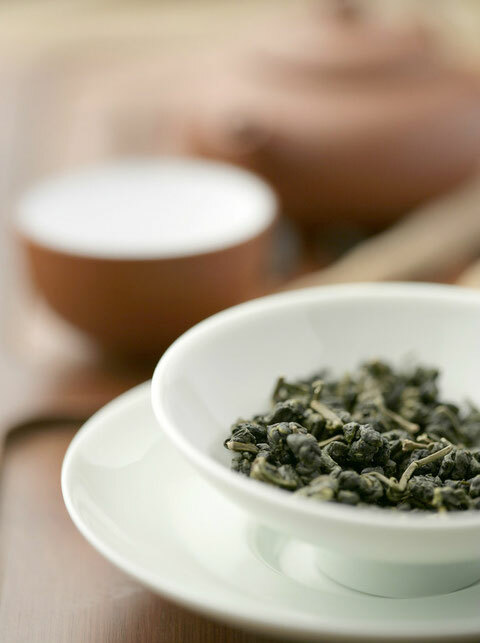 Polyphenols found in oolong leaves eradicate the free radicals from our body, thereby slowing down the aging process. 3. Controls obesity: The polyphenol compound in oolong tea enhances the metabolism of fat in the body by activating certain enzymes hence; daily consumption of oolong tea promotes weight loss and reduces obesity by accelerating the process of lipolysis which enables the body to burn more fat. The oolong tea weight loss is definitely a much healthier path to choose. 4. Prevents tooth decay: Oolong tea improves oral health by inhibiting the growth of bacteria that causes tooth decay and oral cancers. The antioxidants called polyphenols present in oolong tea contribute to the improvement of dental health and hygiene. Drinking oolong tea helps to prevent the build-up of plaque, fights tooth decay and deters the occurrence of cavities. 5. Anti-cancer properties: Tea drinkers in general have a lower risk of acquiring skin cancer. The concentration of polymeric polyphenols like thearubigin and theaflavin is higher in oolong tea when compared to other varieties. These antioxidants combat carcinogens and help in reducing the risk of cancer. Polyphenols promote the programmed cell death (apoptosis) of cancerous growth in the stomach and acts as a chemo-preventive agent to suppress the development of other forms of cancer, specifically ovarian cancer in women. 6. Development of healthy bones: The antioxidants present in oolong tea provide protection against tooth decay and strengthen the bone structure. It is very effective in preventing osteoporosis in the human body. 7. Treatment of diabetes: Oolong tea has higher concentrations of antioxidants called polyphenols in addition to vitamins and minerals such as vitamin A, calcium, potassium, selenium, fluorine, magnesium and phosphorus. These nutrients detoxify the body, improve digestion and lower the risk of chronic diseases such as diabetes. Oolong tea is considered to be an herbal supplement for the treatment of type 2 diabetes. 8. Stress buster: The natural polyphenols present in oolong tea act as stress busters and alleviate mood swings. Drinking oolong tea during the day helps to maintain focus and improves mental agility. 9. Fights bacterial infections: Antioxidants present in oolong tea fight bacterial infections by strongly inhibiting the growth of certain types of streptococci. 10. Treatment of Atopic dermatitis: Atopic dermatitis or eczema is a chronic skin disease characterized by itching, redness, swelling, scarring and sometimes infection of lesions due to frequent scratching. Research has shown that patients who combine dermatological treatment for this condition along with consumption of at least 3 cups of oolong tea a day experience more relief than patients who do not consume this tea. 11. Anti–aging benefits: Continuous exposure of the skin to free radicals accelerates the process of aging and slows down the rate of exfoliation, resulting in the premature occurrence of wrinkles and dark spots. The high levels of antioxidants present in oolong tea, slows down the oxidation of cells leading to a much healthier looking skin. 12. Improves vitality of skin: Regular consumption of oolong tea diminishes wrinkles and improves the tone and elasticity of skin, giving it a more youthful appearance. Polyphenols present in the tea protect the skin from any damage that may be caused due to exposure to sun. 13. Prevention of hair loss: The antioxidants present in oolong tea are known to ensure proper metabolism of the male hormone, DHT, as any change in its metabolic activity results in hair loss. Making a tea rinse with these leaves is of great benefit in preventing excessive shedding of hair. 14. Promotes healthy and shiny hair: A tea rinse made from oolong tea is of a mild and pleasant nature. Not only does it soften, but it also provides an additional lustre to your hair. 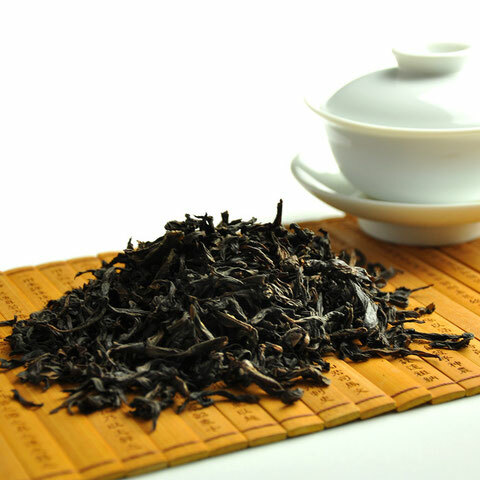 Oolong tea is a wonder tea as is evident from the range of benefits it offers. However, it is wise to exercise caution and consume it in moderation.Since this tea contains a certain amount of caffeine,drinking too much of it can cause side effects ranging from mild to serious headaches, nervousness, irritable bowel syndrome, irregular heartbeat, vomiting, heartburn etc. It is advisable for pregnant women to keep a tab on the number of cups of tea they consume in a day as too much of caffeine might harm the baby. Keep these pointers in mind and go ahead and enjoy your cuppa!